Image caption The hospital trust said its own "financial engagement" was "not strong"
An NHS trust has forecast a "considerable" end-of-year deficit, despite previously agreeing to make "vast" savings. Portsmouth Hospitals NHS Trust admitted its "financial engagement" was "not strong" and forecast a £37m deficit for the year ending in March. It said it could not deliver the savings, and a £10m surplus, it had agreed with regulator NHS Improvement. The deficit will not affect services or involve redundancies, it said. Chief executive Mark Cubbon, who joined in July, said there had been a "culture across the trust in which finances have not been prioritised". In a statement, the trust said: "Financial engagement at all levels across the trust is not strong. "Trust finances haven't been a significant item on the board agenda and this has filtered down into the organisation." 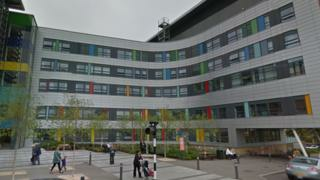 The trust said a three-year financial recovery plan would not involve redundancies or closing or stopping services. It said "greater rigour and control" in future would include limiting spending on agency staff during the current winter pressures. Mr Cubbon was appointed after chief executive Ursula Ward stood down in May 2016. She was replaced by interim chief executive Tim Powell until July last year. Asked if the trust would reduce staffing on wards, he told the BBC: "What we won't be doing is anything that would harm patients." In February 2017, Care Quality Commission (CQC) inspectors reported "sustained improvements" in Queen Alexandra Hospital's A&E, which they had previously described as "chaotic". The CQC rated medical care at the hospital "inadequate" in August, after finding that staff secretly fed pills to patients in their meals and in ice cream. In December, the CQC said the hospital failed to spot cases of lung cancer because it did not check patients' chest X-rays properly. NHS trusts in England are predicting a full-year deficit of £623m - £127m worse than planned - according to the latest accounts published by NHS Improvement in November. The regulator said 170 out of 233 providers expected finances to be within forecast at the year's end.